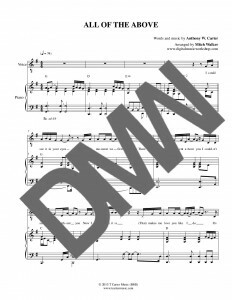 Publication-ready sheet music is what one would expect to find in a music store or online. 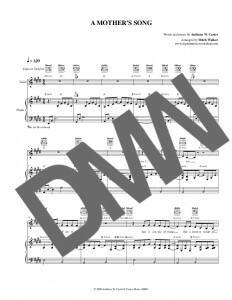 It usually includes a vocal-plus-piano arrangement with chord symbols (with or without guitar fretboard positions), songwriter and publisher information, and a copyright notice. Contact information is also sometimes added. This type of sheet music varies in length, depending on the complexity or simplicity of the arrangement. Offering versions of the sheet music in two or more keys is a low-cost option to consider (i.e. - low key for male vocal and a higher key for female vocal). 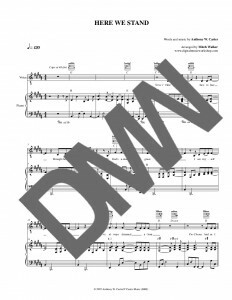 View the titles below for examples of Publication-Ready Sheet Music. Here's an example of a song that was arranged for vocal and piano with chord symbols and guitar fretboard positions. It is ready to publish. Listen to the mp3 and read along. Transcribed and arranged by Mitch Walker. Another song that was arranged for vocal and piano with chord symbols only (no guitar fretboard positions.) Most of this particular piano part is a Takedown. Listen to the mp3 and read along. Transcribed and arranged by Mitch Walker. Another song from T. Carter Music, arranged for vocal and piano with chord symbols and guitar fretboard positions. Listen to the mp3 and read along. Transcribed and arranged by Mitch Walker.